(BEAVER FALLS, Pa.) -- The Geneva community honored four faculty members with awards for excellence in their vocation of teaching, scholarship and service at the annual Academic Convocation ceremony in September. Those awarded were Dr. Robert Reid, Dr. Jenny Carter, Dr. Rodney Austin and Dr. Phil Holladay. Geneva College Provost, Dr. Melinda Stephens announced the award winners, who were nominated by students and faculty. Each award-winner receives a plaque and a $1,000 award. Dr. Robert Reid, engineering, received the Outstanding Service award. Dr. Reid shows exceptional service both locally and internationally. Dr. Reid and his wife mentor and provide learning activities to local latchkey children in their home. Internationally, he leads engineering projects in mission efforts to the Philippines, as well as teaching basic math and physics to orphaned Cambodian children. Dr. Jenny Carter received the Excellence in Part-Time Teaching award. Dr. Carter began teaching part-time at Geneva College in 2014. She was recognized by her students for creating a fun and engaging learning environment. Dr. Rodney Austin, chemistry, accepted the Excellence in Scholarship award. Dr. Austin strives to increase his impact on the field of science, and he encourages students to do the same. Since joining the faculty in 2005, he has often included undergraduate students in research projects and provided them opportunities to present their research and work. He is also heavily involved in the study and presentation of research concerning active-learning strategies. 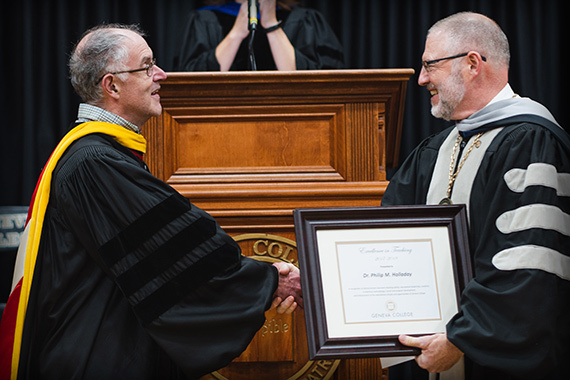 Dr. Phil Holladay, mathematics, won the Excellence in Teaching award. He is highly regarded by his students for his ability to make challenging material and work more manageable, interesting, clear and possible. He is also loved by students for his ability to make time in the classroom more fun and engaging. He has 35 years teaching experience at Geneva College. Geneva College is a Christ-centered academic community that provides a comprehensive education to equip students for faithful and fruitful service to God and neighbor. Offering over 115 traditional undergraduate majors and programs, fully online Adult Degree Programs and high-demand graduate degrees, Geneva’s programs are recognized for their high quality. U.S. News & World Report ranks Geneva as a Top Three Best Value Regional University with one of the top undergraduate engineering programs in the nation. Adhering to the truth of Scripture, a Geneva education is grounded in God’s Word as well as in a core curriculum designed to prepare students vocationally to think, write and communicate well in today’s world.